Sambuca and liqueur specialist Rossi D’Asiago is proving its commitment to the travel retail channel with a bigger and better stand at TFWA World Exhibition (Green Village, L73). The company has decided to invest in a larger stand at the prestigious duty free show in order to showcase its portfolio of Sambuca products in the best light. “The travel retail market continues to be a top priority for us. We know there are an array of opportunities for our brand in the channel. We are so confident that our brand is ideal for travel retail that we have upped our investment at TFWA World Exhibition and have a bigger stand for our current and potential customers to come and visit us,” comments Nicola Dal Toso, Export Director, Rossi D’Asiago. This year sees Rossi D’Asiago return with its counter top display for its 5cl miniature Antica Sambuca bottles. Aiming to open up new opportunities with cruise, ferries and airlines, the Antica Sambuca branded display is ideal for the duty free market as it allows for a number of bottles to be displayed in an eye-catching way, whilst at the same saving shelf space. Export Director Nicola Dal Toso, Rossi D'Asiago, adds, "Our counter top display unit is ideal for point of sale merchandising. 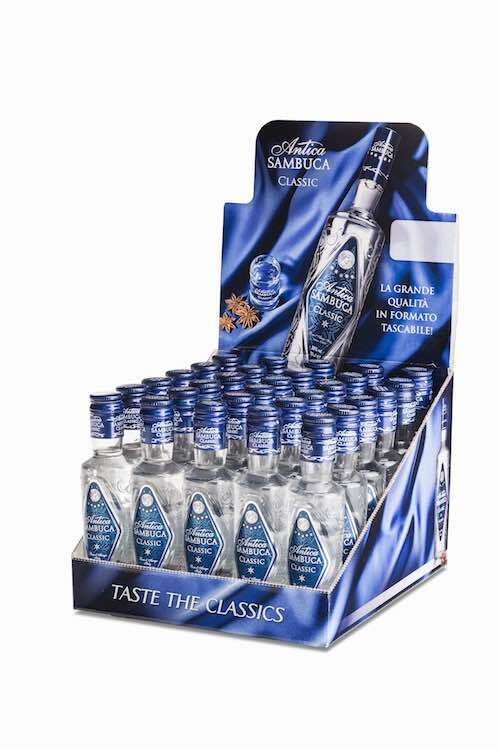 We are aware that a lot of purchases in duty free are on impulse, so ensuring Antica Sambuca is available in a format that allows for such POS displays was vital for our global TR strategy. " Each counter top display unit can hold 30, 5cl Antica Sambuca bottles.